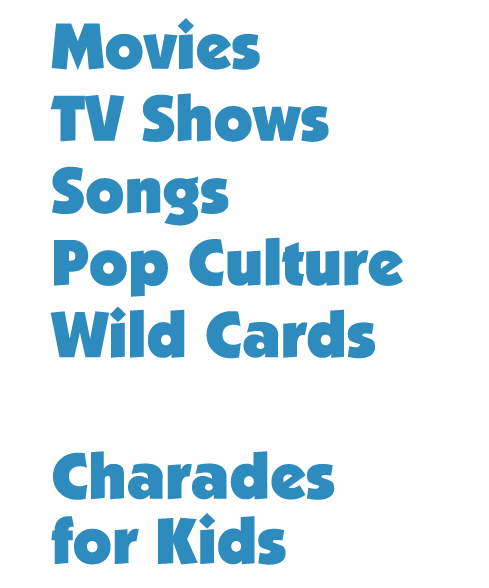 Backwards Charades™ is an entertaining and fun twist on the classic game of charades. Instead of one person acting out a clue for a team to guess, an entire team acts out clues for one person to guess. Now everyone is in on the fun! In 60 seconds, the teams attempt to guess as many charades words or phrases as they can. This imaginative twist usually results in tons of laughter and lots of fun. The idea is simple: instead of one player acting and his teammates guessing, here everyone acts and only one person guesses. It is a simple turn of events that truly elevates the fun. The best part is watching a group of people attempt to spontaneously coordinate themselves in order to get the teammate to guess the charades word or phrase. And it’s also suitable for just about any age. The game works great and is awesome to play. Give it a try. Backwards Charades™ is a great way to end an evening of Classic Charades! Backward Charades™ is great for adults! Great for kids! All the same Charades Rules apply! No sounds, no words! Approved & tested Charades Ideas to get your game on! Trademark registration for product and intellectual property identification.